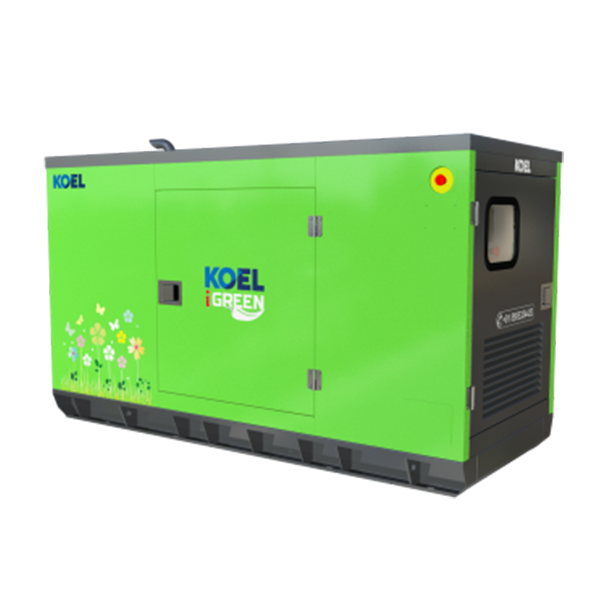 KOEL Green is the Genset brand of Kirloskar Oil Engines Ltd (KOEL), the flagship company of the century old Kirloskar Group. KOEL Green is India's largest selling and most trusted Genset brand for over a decade. Providing back-up power solutions from 15 to 5200 kVA for diverse market sectors, "KOEL Green" has over 1 million Gensets in service across the globe. Owing to extreme operating conditions in India, preference has been given to robust configurations, that have been running successfully for several years. Also, KOEL is the only manufacturer which provides you with the benefits of choice in terms of Air cooled and Water Cooled gensets. KOEL Green Gensets offer a unique combination of CPCB norm compliance and enhanced fuel efficiency. Across the range, KOEL Green Gensets offer substan&al savings in fuel cost. Genset ratings are selected based on the present load and future expansion. Fuel efficiency of most Gensets is optimized at the full rating of the Genset. In practice, Gensets rarely get loaded to full capacity. Power demand varia&tions across day & night, weekdays & weekends. Summer & winter lead to an average 50-70% loading on the gensets. Considering this practical situation, KOEL has extended fuel efficiency optimization from 100%, right up to 50% of rated load. Combination of best-in-class fuel efficiency & O2E provides a double advantage. There is no comfort like being in command. KOEL Green Gensets put the command in your hands. Micro-processor based Genset controllers display a host of Genset parameters and put all controls at your fingertips. KOEL Green Gensets have always been preferred for their robust design and reliability over long usage life. KOEL Green range carries the confidence of well-established and proven engine platforms. For compliance to revised CPCB norms, KOEL has carefully selected those technologies which not only retain, but enhance Gensets durability and on-site serviceability. Thus, KOEL Gensets offer you many years of trouble-free performance; backed by the assurance of prompt support. Peace-of-mind driven by product reliability and low cost of ownership. KOEL Chhota Chilli Gensets comes with a promise of assured delivery within 7 days of confirm order placement. Genset being a high value capital purchase may lead to needless block of capital and hence need not be purchased in advance. It is prudent to order the genset at the right time and plan the deliveries in line with your readiness to use. This will also avoid damages to genset due to lying unattended at site and engine re-validation cost. KOEL AMFi panels automatically switch on your genset when the mains supply fails and switch off the genset when the mains supply restores giving you un-matched convenience. 'Prime power' is designed for unlimited hours, as compared to 'Emergency stand-by&' designed for 200 hours in a year. Prime rated Gensets also permit 10% temporary overloading. Users need to carefully select the Genset rating to meet their requirement. KOEL offers Prime power as a standard offer. *Contact KOEL for stand-by ratings. Engine capacity (cc) plays a vital role in Genset performance. Higher engine capacity leads to a robust and stable Genset performance. Higher engine capacity also enables the Genset to respond quickly & positively to sudden load additions. Head Office : 4114, TNHB, LIG -1, 5th Main Road, Ayapakkam, (Near DUNLOP Factory, Ambattur), Chennai – 600 077, Tamilnadu. MKN Road, Guindy Chennai – 600 032. Copyright © 2014-2019 Vel Engineers. All Rights Reserved.